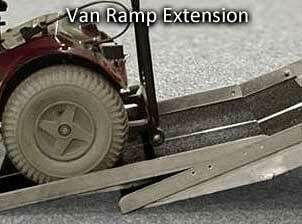 The rear door van ramp comes in two lengths, 7' long and 8' long, both are 27" wide. The Van Ramp bolts to the floor of the van and unfolds out of the vehicle with the aide of springs to lighten the load. This ramp is not suitable for vans which have fold-down rear seats that fold into the floor of the vehicle. 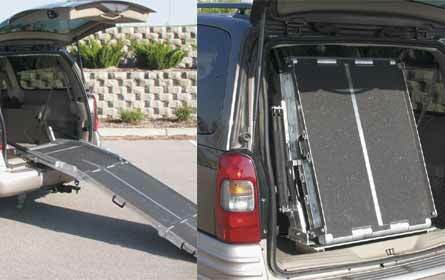 There is an adapter plate for the ramp which is available for vans with a threshold. This ramp has an 800 pound weight capacity and it is intended for loading and unloading an unoccupied scooter or motorized wheelchair. Please refer to the note below for minimum size requirements as well as the installation instructions for a complete understanding of the vehicle requirements. NOTE: 34" minimum inside door opening required for this ramp. Minimum requirement for floor to ceiling opening: 7' Ramp-37", 8' Ramp-41".